The Arthur L. and Maxine Sheets Rybolt Health Sciences and Recreation Center opened in March 2006. The state-of-the-art facility is home to the health sciences and athletic training departments and houses faculty offices, six fully equipped multi-media classrooms, a 4,000 square foot athletic training room, the 1,600 square foot Messerly Human Performance Laboraty, as well as a student omputer lab and reference library. The Recreation Center contains a walking/running track, fitness center, golf simulator, racquetball court, climbing wall, billiard lounge, the Messerly Natatorium, two basketball courts, and a multi-purpose court. 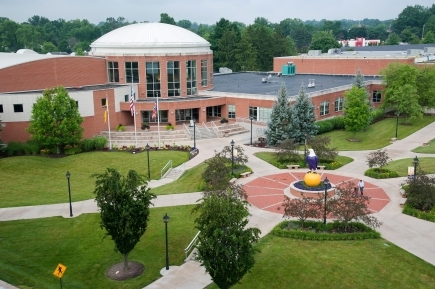 The complex is connected to the Kates Gymnasium, the home venue for our basketball, volleyball and wrestling teams. In 2013 the gym received a $1 million renovation resulting in a new floor, lighting, bleachers and scoreboard.